folks working in town only have window of time for lunch break. now they can pre-order (and pay) for their food, pop in and pick it up to go! making pies all day, every day during the season... you just gotta have music streaming all the time. so we blasted a wireless signal from the house out to the pie shop! steve & debbie notinger have been clients of compusult since 2002. this aug, they opened their own firm and of course we were there to assist with the network and all their computing needs! we even introduced them to a new online case management system to track all their time and do billing! aug in bar harbor - prime season. impossible to have the system down during the day, so we came in at midnight and swapped out the main pos server pc <yawn> that was a long night! this gorgeous inn was built in 1887, but the owners have done extensive renovations - including some super soundproofing insulation... this stuff is super dense and tough for wi-fi, but with matt's amazing cabling skills, we got antennas where they need to be. now guests can blaze on the internet and write fantastic reviews of their stay! david-g is moving to florida - we all are gonna miss him! what a fantastic job this young man has done! very large deck, the restaurant, some employee housing and 2 businesses out front all got a new public wi-fi hotspot this year. folks need to checkin to facebook when they arrive on-site! days inn has a spiffy new public wi-fi system. this building is 520' long!!! fantastic coverage in all rooms on both floors. nothing like happy guests in their hotel rooms! the attorneys at roy, beardsley, williams and granger realize data is critical. dropbox for business has unlimited backup of every version of every file. and you can access files from home office or mobile devices. you can send links to large files or folders to allow emailing of large files. maggie has come to save the paperwork day!!! yippee! parking lot and even one in the walk-in freezer in a restaurant!!! when you make the best sandwiches around, everybody wants one. but real food takes time - so order your sandwich early and it's ready when you get there! a sports bar & pizza joint in bar harbor that stays open very late and delivers... sounds like a perfect opportunity for an online ordering system! order and pay for your pizza right from your pc or phone! even a small counter service selling lobster can benefit from automating! c-ray lobster had amazing growth once they were listed in tripadvisor - so they needed ability to efficiently handle orders, and their own smartphone app is pretty cool too! nothing worse than expensive software that is just too complicated and cumbersome to use! we listened to what bar harbor catering needed to run their business and researched the software - found a powerful yet simple to use solution and they love it! as usual, side street cafe is introducing something new to bar harbor - online ordering from your computer or smartphone app! sips cafe in southwest harbor has gone digital - the 2 terminal point of sale system will allow servers to enter orders which then print at the kitchen and the bar. the system will also keep track on inventory used - even the wine and spirits poured at the bar! we had our first session in our brand new training room in ellsworth! note that this pic was taken with the security camera that compusult installs! you could have this view of your business from your smartphone!!! john williams boat company is hosting the ny city yacht club for a weekend. cell coverage is notoriously horrible on sommes sound, so we installed a wilson amplifier for the yachts moored - everyone stayed connected! installed a 3 terminal pos system at finn's irish pub in ellsworth. this allows them to enter orders much faster and with greater accuracy. what a fun group of folks at finn's!!! one of the first items on the upgrade list - install a public wi-fi hotspot in the pool area (for those folks not swimming of course!) now parents can check email and facebook while their kids are having a blast in the pool! giving back to the community is so very important. 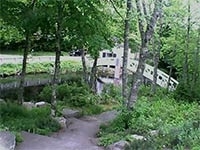 compusult is proud to donate $500 to harbor house community center in southwest harbor. the programs are for everyone of all ages, but the ones for kids are especially wonderful - thanks for doing a great job harbor house!!! seal harbor & northeast harbor don't have very good cell phone coverage because the nearest cell tower is 13 miles away on swan's island! 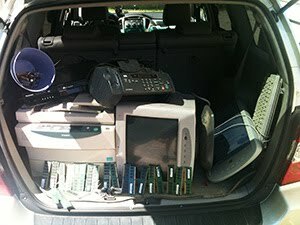 Compusult collected customers' old electronics recycled them at the SWH Transfer Station universal waste day. 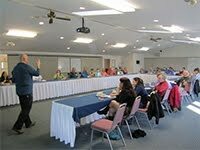 partnered with breaking even communications to teach a quick boot camp for the bar harbor chamber. topics ranged from what is the cloud to optimizing your pc to 'your customers have smartphones - period' to facebook & social media and more... and to top it off - a kindle fire was raffled off! kids are our future, and the more exposure to technology and science they have the better! convert (2) lawyer's office's and an HVAC company's email (about 30 users total) from Exchange on their servers to Google Apps - Gmail. Their email address stay the same - now they login to Gmail to get their email, calendar, contacts and tasks - and now all employees can sync to their iPhones or Droids! Evaluate the current inefficient billing system consisting of a typewriter, notebooks and (2) software packages that forced them to enter the same thing 2-3 times every time and propose a new single entry system with QuickBooks. Setup Wi-Fi Hotspot at a compound of (4) beautiful rental cottages for Margo Stanley Real Estate. What a fantastic location!!! So quiet! 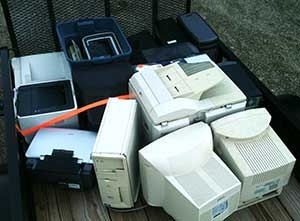 Compusult offered to pickup customers' old electronics and paid to have them recycled at the SWH Transfer Station. Thanks to Acadia Cottages for the use of their trailer!!! Use your iPhone to check reviews of your favorite wine and cheese - then pop down to Sip's and update your Facebook page to let your friends know about the fantastic meal you just had! We have found a store in Ellsworth that uses old PC's and laptops for parts! *Also installed a 3G micro cell so staff could have cell phone coverage! Imagine being a waitress/waiter serving a party of 8. The bill comes and they decide they want separate checks... now it's easy for the staff at Fiddlers' with their new Point of Sale System. Wait Staff enter orders on one of 3 computers and the printers at the bar, the kitchen line and the salad bar all print out immediately. Automating a manual system has many benefits that will help your business run more efficiently, which of course will add to your bottom line profit! 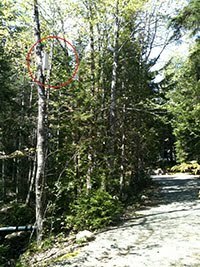 Acadia Cottages has 11 rental cottages nestled in a wooded setting - they needed wireless signals for their customers. An outdoor omni-directional antenna was mounted in the center of the cottages and now all enjoy highspeed internet! Compusult hits 10 year milestone!